"Art is my life, the apparently endless walk from birth to death. My ideas and inspirations come from everything I meet on my way. Each film is always a new adventure; a blank sheet to work on. Each of my works can be seen as a journey, but also as a re-birth." Maria Korporal was born 1962 in Sliedrecht, the Netherlands. She studied graphics and painting at the St. Joost Academy of Fine Arts in Breda. During her studies she began working with photography and she graduated with, among other things, a video installation. After her studies, in 1986, she moved to Italy, where she returned to painting. In 1989 she co-founded the Italian publishing house Apeiron, directing the production and book design. In this environment she became involved with the use of computers, and she began applying digital techniques also in her art work. Since 1998 she has dedicated herself to using the new media arts for her expression. Since 2014 she has settled in Berlin. 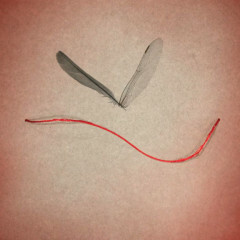 Fourteen seconds to decide: will you stay or fly away? 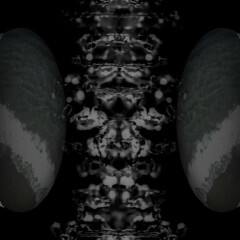 The video has been created on a piece of "musique concrete" which deals with the theme of incommunicability. Composer Emiliano Pietrini (Globoscuro) constructed his music on a series of "nonsense" dialogues, using random recordings he has done over the years with various Italian, American and Spanish artists. 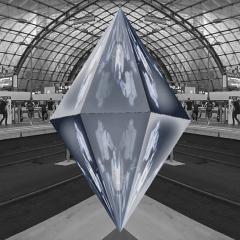 Following this sound trail, video artist Maria Korporal created a visual walk in the main railway station of Berlin - a walk along a platform where all lines loose themselves in the center. Out of this vanishing point a crystal is born, in which walking and talking people are captured. The crystal turns around and splits up into more fragments, then melts into slow moving ink-like stains where all communication seems to flow together. At the end of the platform, the liquid forms become a crystal again, opening itself for a journey to continue in new times and new spaces. 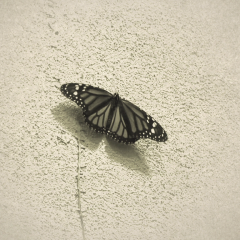 An old Native American legend tells that an insect stole the shadow to those who did not respect nature. Deprived, in this way, of their soul, the men became ill. Only with music and singing they were able to finally get their shadow back and live happily ever after. 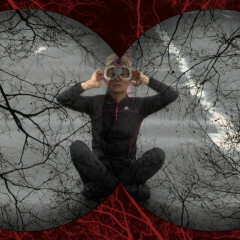 In this video, the artist acts with what she calls her “third eye”: a small video camera attached to her forehead. On the runway of the historical airport Tempelhof in Berlin she takes off and flies into outer space. We see what she sees through her third eye, as she reaches the area of which Man Ray spoke about in his “Pepys Diary” (1959): “Somewhere in outer space the images of the entire history of mankind travel on the airwaves”. 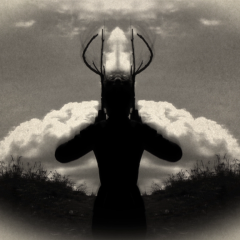 The video has been inspired by the novel "The Cloven Viscount" by Italo Calvino. The story "The Cloven Viscount" begins with a desolate landscape and a war scene. 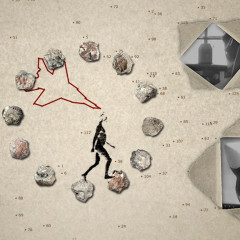 These two images are found in the video in a walk among rocks, dirt and fragments of sculptures, accompanied by the hum of insects. 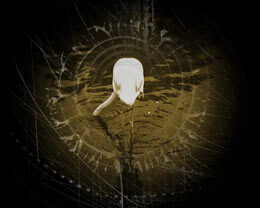 The invisible walker stops at a human head sculpture, which is unexpectedly split in two. 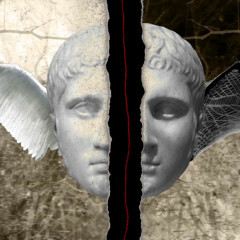 From the two halves of the head sprout two wings, one of a devil and the other one of an angel, flying along a road that seems endless. In the black furrow that divides the head appears a red thread. At that point, the artist's hands intervene: with needle and thread they reconnect the two halves. 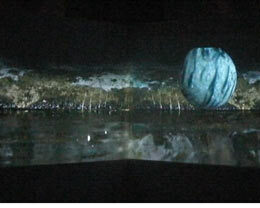 “Attempt to form squares instead of circles around a stone falling into water” and “Attempt to fly”, two works by Gino De Dominicis from 1969, inspired Maria Korporal in her performance in this video. Defying the laws of gravity, the artist tries to immerse herself in the immortality so much longed for by De Dominicis. Why do humans do themselves harm? Why do they destroy the nature they are part of? These are the questions that the artist, as part of humankind, asks herself, through a variety of expressive spaces and languages including performances, fragments of historical films and animated drawings on paper. The whispers of “nevermore” pronounced by the artist and transformed into voices both feminine and masculine make us think of a promise sealed with a kiss – a promise that takes wing and is carried off by the wind. The uncertainty that marks mankind’s destiny finds an echo in the call of the crows: their “cras, cras!” means “tomorrow, tomorrow!” in Latin. These cries may signify hope, but also indecision and the eternal postponement of choice. Avgerinos & Poulia, a film by Maria Korporal with music by Sofia Koubli, is inspired on a Greek fairytale. 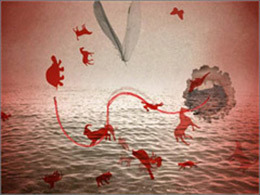 According to Greek tradition, the story developes itself from a red string which transforms continuously, appears, disappears and re-appears again, and leads the protagonists along the way of the tale – to grow finally into a constellation tree and give birth to the two luminous stars of brother and sister Avgerinos and Poulia. The artist portraits herself sleeping in a warm and cosy ambient near the fireplace with the cat purring. She falls into a dream in which she seems to experience a rebirth. 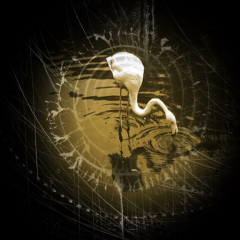 A flamingo with its head in the water is moving in concentric circles creating a whirlpool. Struggling with her arms and legs, the artist finaly manages to emerge. 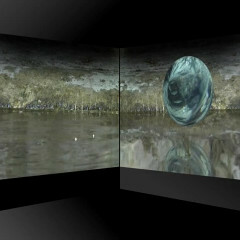 Two video loops of each 5:36 for projection on two adjacent walls. On the left spheres of stone come out of the water and rise slowly until they vanish in the sky: birth of bodies. On the right spheres of water with fishes come down from the sky and fall slowly into the water: return to the origin. 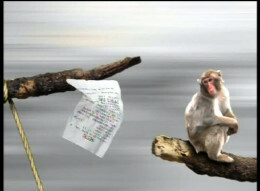 The video is part of the project Korporal Zoo, a series of short movies which deal with the relationship between animals and human beings studied from several prospectives: cultural, social, environmental. In The Waltz appear birds flying freely, and a couple of women (they can be sisters, friends, lovers) closed in a cage, who dance an endless waltz. At the end they manage to liberate themselves… The video has a clear reference to gender issues and women’s emancipation. The video is part of the project Korporal Zoo, a series of short movies which deal with the relationship between animals and human beings studied from several prospectives: cultural, social, environmental. 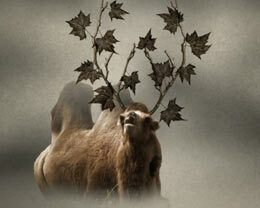 Desert Tree, is based on a Mongolian legend about camels, and refers to the environmental problem. The Mongolian legend goes like this: Many years ago, God gave antlers to the camel, as a reward for the goodness of its heart. But one day a rogue deer came and asked the camel to lend him his antlers. He wanted to adorn himself with them for a celebration in the west of the country. 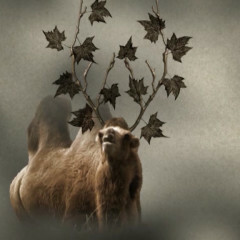 The camel trusted the deer and gave him his antlers. But the deer never brought them back. Since then, the camels keep gazing at the horizon and still await the deer's return. The video opens with a shot of a crowd of people engrossed in the Saturday afternoon shopping ritual in Via del Corso in Rome. Movement and noise begin to speed up before dissolving into a blurred whole with indistinct sounds. 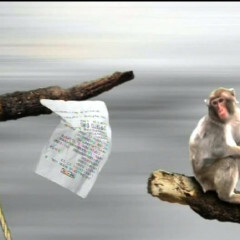 This is the background before which the second scene unfolds: a kind of parallel universe, of animals – a few monkeys, a giraffe, a tortoise – attending to their daily activities of feeding and grooming themselves, or of simply looking around. The atmosphere is calm and pleasant. The crowd of shoppers is just a silent, abstract backdrop now but intrudes in a number of shots through annoying fragmented images and sound clips as a few till receipts flutter slowly to the ground. A wise, unruffled tortoise walks slowly among the crumbled pieces of paper that are scattered on the ground. However, the peaceful mood is disturbed by the harsh sound of a car horn. The relentless coming and going of passing motor vehicles obliterates everything.